If you’ve never tried Swedish Pancakes, you, my friend, are missing out. 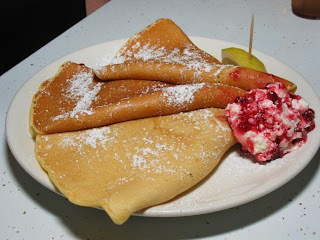 Swedish Pancakes are light, fluffy pancakes that you spread yogurt or jelly on and then roll up. They are SO good. They are also fairly easy to make, with a little practice. Chris made them for dinner tonight and we devoured them. I don’t have appropriate permissions to post the family recipe, but AllRecipes.com has one that should serve you well. The trick in making Swedish Pancakes come out right is to get the pan hot before you add the batter. Test the pan with a drop of water – if it sizzles, your temp is right. Pour some batter into the pan, and then tilt the pan to evenly spread out the batter. Add yogurt or jelly and enjoy!